Select Edit ArtSet from the ArtSets menu. 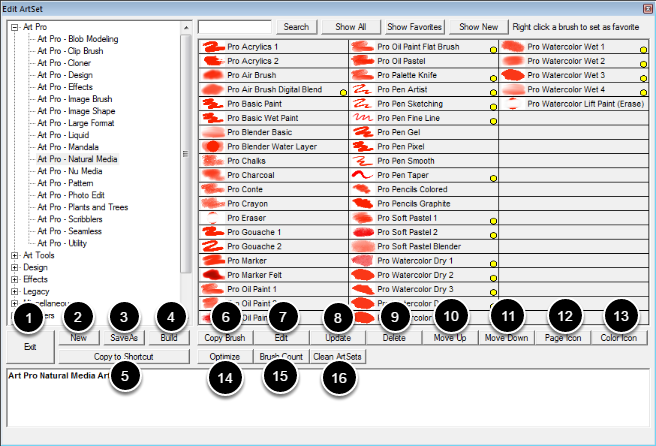 The Edit ArtSet dialog is very similar to the Select Brush dialog however its function is not about selecting a brush but editing ArtSets. 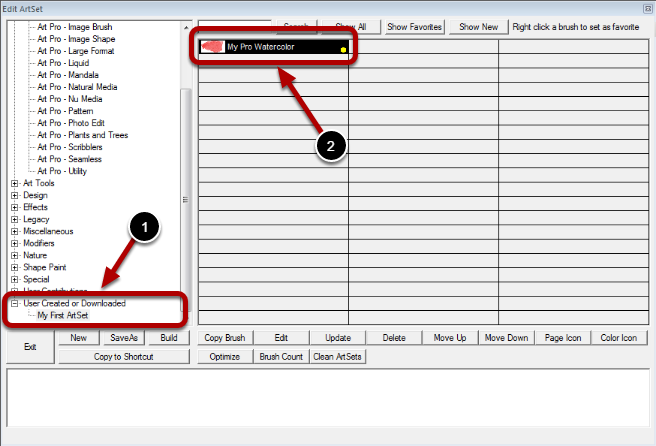 See the Select Brush Dialog topic for details about using the common control areas of this dialog. The Exit button will close the Edit ArtSet dialog. The New button is used to create a new ArtSet. When selected a dialog will be presented to select a name. afterwords the new ArtSet with no brushes assigned will be selected. The SaveAs button will save the selected ArtSet to a new ArtSet name that you supply. The exiting ArtSet will remain unchanged. The Build button is used to enter into the Build Mode. See the topic on Using Build Mode for more details. 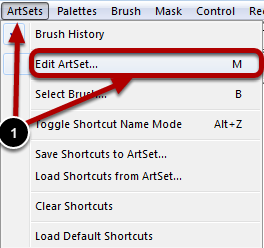 The Copy to Shortcut button will copy the selected ArtSet brushes to the Brush Shortcuts. The Copy Brush button will copy the selected brush to the clipboard for placement in another brush slot in any ArtSet. The Edit button will display the Brush Options dialog. See the Brush Options Dialog topic for more details. The Update button will update the selected brush in the ArtSet with the currently selected brush in the shortcuts. Basically the brush you are painting with will update the brush in you select in this dialog. The Delete button will remove the selected brush from the ArtSet. The Move Up button will move the selected brush up one position in the ArtSet swapping positions with the one before it. The Move Down button will move the selected brush down one position in the ArtSet swapping positions with the one after it. The Page Icon button will take the content of the current page and make it the icon for the selected brush. The Color Icon button will take the current color bar colors and make it the icon for the selected brush. The Optimize button will arrange brush effects for each brush in the selected ArtSet for better performance. The Brush Count button will total up every brush currently installed. The Clean ArtSet button will clean up hidden data in the ArtSet that will make it easier for those manually editing the ArtSet data file. Select the ArtSet to save the brush into. Click on an empty slot to store your brush there. You will be presented the Brush Options dialog where the name and other brush options can be set. Set the Brush Options Dialog topic for more details.